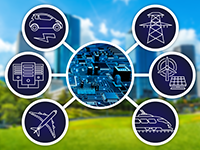 Opcondys will develop a high-voltage power converter design for energy storage systems connected directly to the power grid. Opcondys' converter design will use a modified switched multiplier topology that will allow connection to utility transmission lines without intervening step-up transformers. It uses a photonic, wide bandgap power switching device called the Optical Transconductance Varistor. This is a fast, high-voltage, bidirectional device which reduces the number of circuit elements required for charging and discharging the storage element. By operating at 100 kHz it is possible to increase efficiency to 99% compared to 95-98% efficiency of traditional converters. The system also reduces the size of the passive elements by 50% and, because of the optical control, mitigates electromagnetic interference issues. The elimination of step-up transformers further reduces system size, and can enable a lower cost than existing systems. If successful, project developments could open the door to increased integration of grid-level energy storage.